The chapter authors engaged in multiple technical discussions via teleconference between January and June 2012, which included careful review of the foundational TIR and of 58 additional technical inputs provided by the public, as well as other published literature and professional judgment. Discussions were followed by expert deliberation of draft key messages by the authors and targeted consultation with additional experts by the lead author of each message. 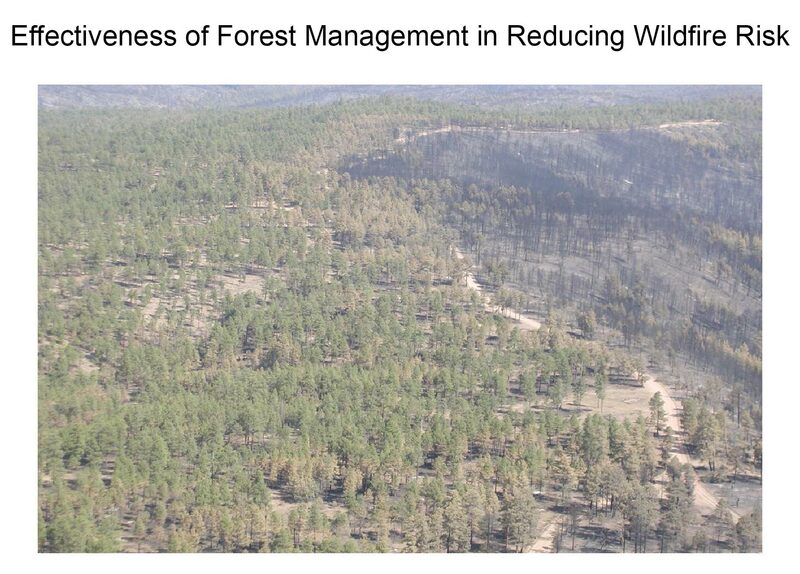 The key message and supporting text summarizes extensive evidence documented in the TIR, “Effects of Climatic Variability and Change on Forest Ecosystems: A Comprehensive Science Synthesis for the U.S. Forest Sector.”1 Technical input reports (58) on a wide range of topics were also received and reviewed as part of the Federal Register Notice solicitation for public input. Although it is difficult to detect a trend in disturbances because they are inherently infrequent and it is impossible to attribute an individual disturbance event to changing climate, there is nonetheless much that past events, including recent ones, reveal about expected forest changes due to future climate. Observational13 and experimental4 studies show strong associations between forest disturbance and extreme climatic events and/or modifications in atmospheric evaporative demand related to warmer temperature. Regarding eastern forests, there are fewer observational or experimental studies, with Dietz and Moorcroft15 being the most comprehensive. There are insufficient data on trends in windthrow, ice storms, hurricanes, and landslide-inducing storms to infer that these types of disturbance events are changing. Very High. 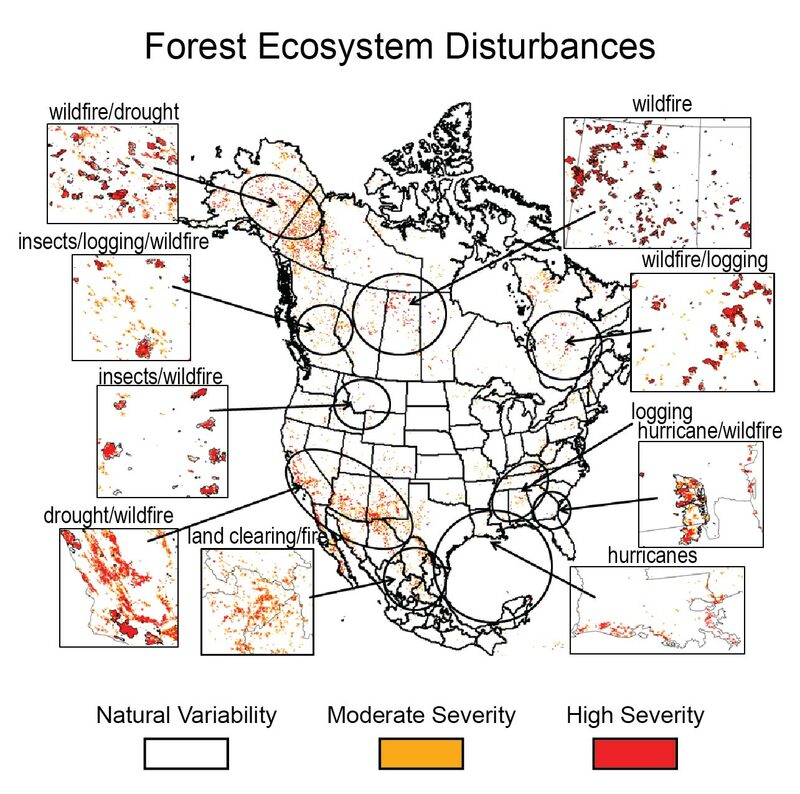 There is very high confidence that under projected climate changes there is high risk (high risk = high probability and high consequence) that western forests in the United States will be affected increasingly by large and intense fires that occur more frequently.5,6,7,8,9 This is based on the strong relationships between climate and forest response, shown observationally13 and experimentally.4 Expected responses will increase substantially to warming and also in conjunction with other changes such as an increase in the frequency and/or severity of drought and amplification of pest and pathogen impacts. Eastern forests are less likely to experience immediate increases in wildfire unless/until a point is reached at which warmer temperatures, concurrent with seasonal dry periods or more protracted drought, trigger wildfires. Warmer winters allow more insects to survive the cold season, and a longer summer allows some insects to complete two life cycles in a year instead of one. Drought stress reduces trees' ability to defend against boring insects. 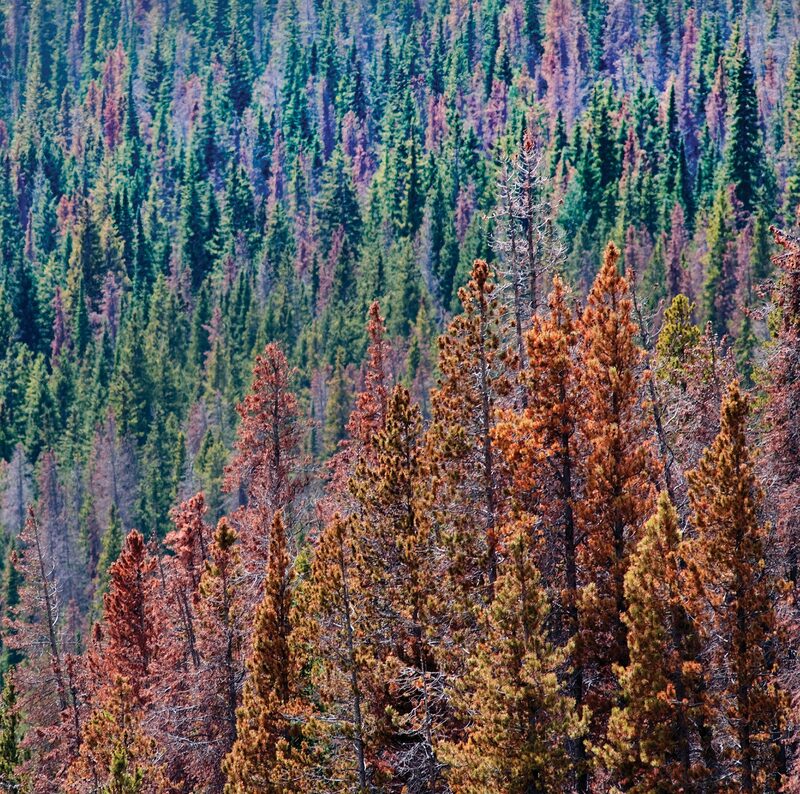 Above, beetle-killed trees in Rocky Mountain National Park in Colorado. 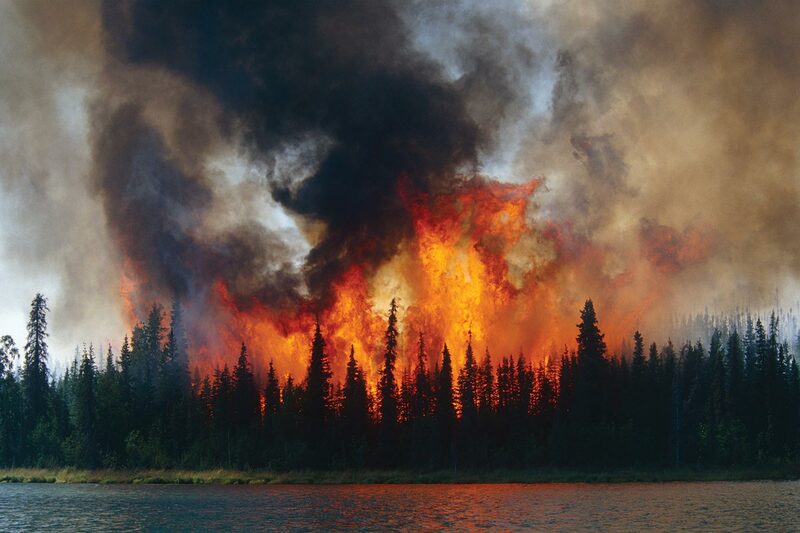 Climate change is contributing to increases in wildfires across the western U. S. and Alaska. Given strong relationships between climate and fire, even when modified by land use and management, such as fuel treatments (Figure 7.2), projected climate changes suggest that western forests in the United States will be increasingly affected by large and intense fires that occur more frequently.5,6,7,8,26,9 These impacts are compounded by a legacy of fire suppression that has resulted in many U.S. forests becoming increasingly dense.27,28,29,30 Eastern forests are less likely to experience immediate increases in wildfire, unless a point is reached at which rising temperatures combine with seasonal dry periods, more protracted drought, and/or insect outbreaks to trigger wildfires – conditions that have been seen in Florida (see Ch. 17: Southeast). That economic factors and societal choices will affect future carbon cycle of forests is known with certainty; the major uncertainties come from the future economic picture, accelerating disturbance rates, and societal responses to those dynamics. Based on the evidence and uncertainties, confidence is high that climate change, combined with current societal trends regarding land use and forest management, is projected to reduce forest CO2 uptake in the U.S. The U.S. has already seen large-scale shifts in forest cover due to interactions between forestland use and agriculture (for example, between the onset of European settlement to the present). There are competing demands for how forestland is used today. 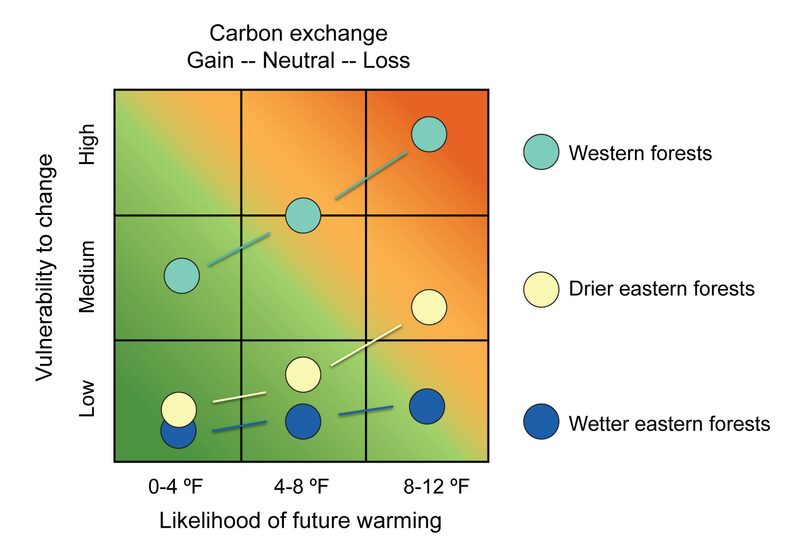 The future role of U.S. forests in the carbon cycle will be affected by climate change through changes in disturbances (Key Message 1), growth rates, and harvest demands. 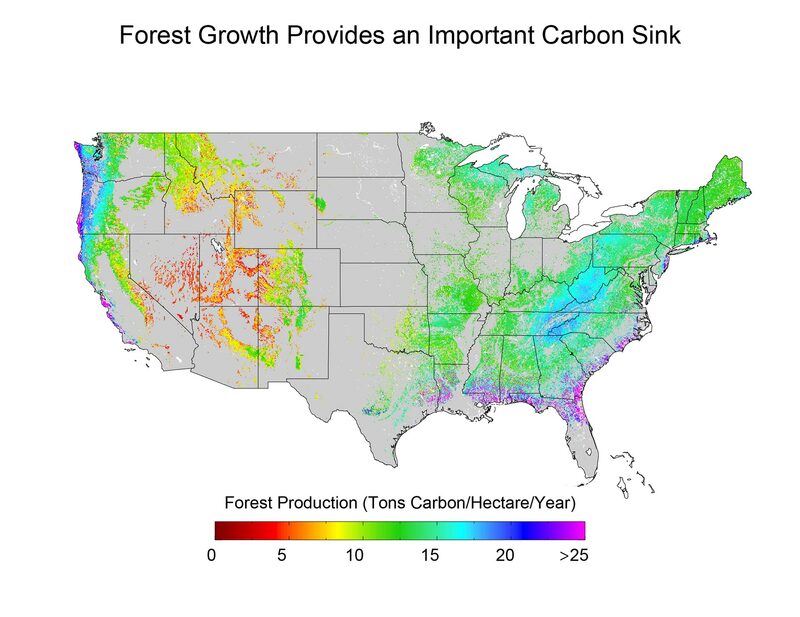 By the end of the century, snowmelt may occur a month earlier, but forest drought stress could increase by two months in the Rocky Mountain forests.54 In the eastern United States, elevated CO2 and temperature may increase forest growth and potentially carbon storage if sufficient water is available.1,37,55 Despite recent increases in forest growth, future net forest carbon storage is expected to decline due to accelerating mortality and disturbance. The key message and supporting text summarize extensive evidence documented in the TIR, “Effects of Climatic Variability and Change on Forest Ecosystems: A Comprehensive Science Synthesis for the U.S. Forest Sector.”1 Technical input reports (58) on a wide range of topics were also received and reviewed as part of the Federal Register Notice solicitation for public input. Studies have shown that harvesting forest bioenergy can prevent carbon emissions76,77 and replace a portion of U.S. energy consumption to help reduce future climate change. Some newer literature has explored how use of forest bioenergy can replace a portion of current U.S. energy production from oil.21,47 Some more recent publications have reported some environmental benefits, such as improved water quality40,78 and better management of timber lands,47 that can result from forest bioenergy implementation. 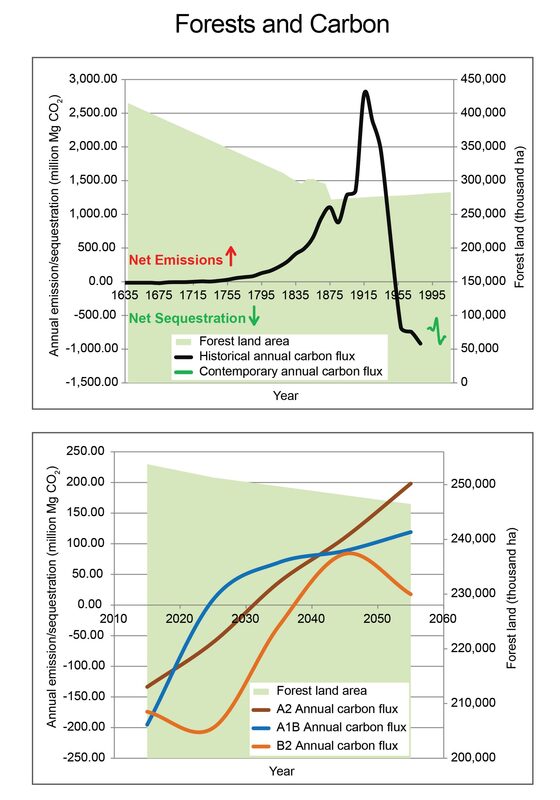 The potential for biomass energy to increase forest harvests has led to debates about whether biomass energy is net carbon neutral.81,82,83,84 The debate on biogenic emissions regulations revolves around how to account for emissions related to biomass production and use.85 Deforestation contributes to atmospheric CO2 concentration, and that contribution has been declining over time. The bioenergy contribution question is largely one of incentives for appropriate management. When forests have no value, they are burned or used inappropriately. Bioenergy can be produced in a way that provides more benefits than costs or vice versa. The market for energy from biomass appears to be ready to grow in response to energy pricing, policy, and demand; however, this industry is yet to be made a large-scale profitable enterprise in most regions of the United States. High. Forest growth substantially exceeds annual harvest for normal wood and paper products, and much forest harvest residue is now unutilized. Forest bioenergy will become viable if policy and economic energy valuations make it competitive with fossil fuels. Forest biomass energy could be one component of an overall bioenergy strategy to reduce emissions of carbon from fossil fuels,76,77 while also improving water quality40,78 and maintaining lands for timber production as an alternative to other socioeconomic options. Active biomass energy markets using wood and forest residues have emerged in the southern and northeastern United States, particularly in states that have adopted renewable fuel standards. 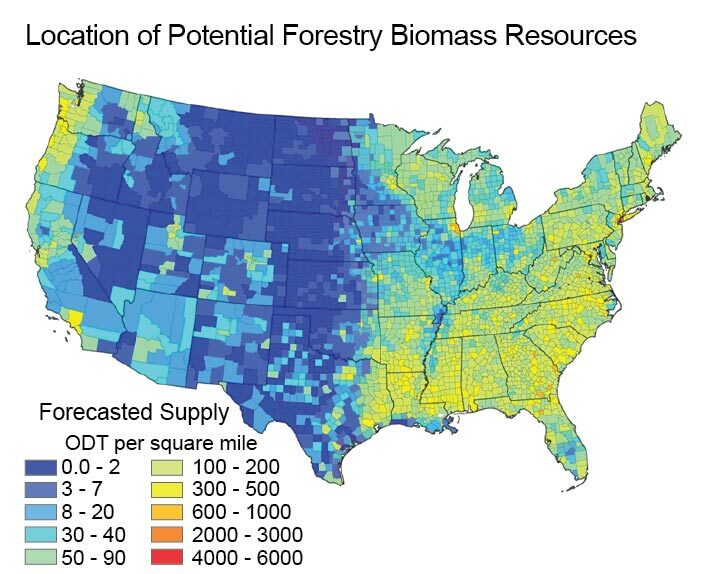 The economic viability of using forests for bioenergy depends on regional context and circumstances, such as species type and prior management, land conditions, transport and storage logistics, conversion processes used to produce energy, distribution, and use.79,80 The environmental and socioeconomic consequences of bioenergy production vary greatly with region and intensity of human management. The potential for biomass energy to increase timber harvests has led to debates about whether forest biomass energy leads to higher carbon emissions.46,81,82,83,84 The debate on biogenic emissions regulations revolves around how to account for emissions related to biomass production and use.85 The forest carbon balance naturally changes over time and also depends on forest management scenarios. For example, utilizing natural beetle-killed forests will yield a different carbon balance than growing and harvesting a live, fast-growing plantation. Markets for energy from biomass appear to be ready to grow in response to energy pricing, policy, and demand,46 although recent increases in the supply of natural gas have reduced the perceived urgency for new biomass projects. Further, because energy facilities typically buy the lowest quality wood at prices that rarely pay much more than cutting and hauling costs, they often require a viable saw timber market nearby to ensure an adequate, low-cost supply of material.88 Where it is desirable to remove dead wood after disturbances to thin forests or to dispose of residues, a viable bioenergy industry could finance such activities. However, the bioenergy market has yet to be made a profitable enterprise in most U.S. regions. Human concerns regarding the effects of climate change on forests and the role of adaptation and mitigation will be viewed from the perspective of the values that forests provide to human populations, including timber products, water, recreation, and aesthetic and spiritual benefits.1 Many people, organizations, institutions, and governments influence the management of U.S. forests. 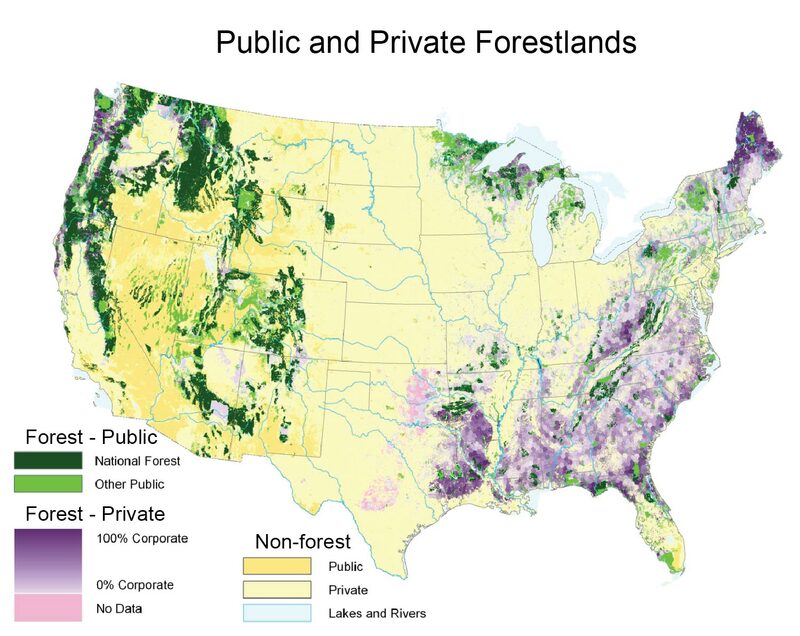 Economic opportunities influence the amount and nature of private forestland (and much is known quantitatively about this dynamic) and societal values have a strong influence on how public forestland is managed. However, it remains challenging to project exactly how humans will respond to climate change in terms of forest management. Climate change will alter known environmental and economic risks and add new risks to be addressed in the management of forests in urban areas, the wildland-urban interface, and rural areas. The capacity to manage risk varies greatly across landowners. While adaptation strategies provide a means to manage risks associated with climate change, a better understanding of risk perception by forest landowners would enhance the development and implementation of these management strategies. Identification of appropriate monitoring information and associated tools to evaluate monitoring data could facilitate risk assessment. Information and tools to assess environmental and economic risks associated with the impacts of climate change in light of specific management decisions would be informative to forestland managers and owners. Given the evidence base and remaining uncertainty, there is medium confidence in this key message. Climate change and global and national economic events will have an integral impact on forest management, but it is uncertain to what magnitude. While forest landowners have shown the capacity to adapt to new economic conditions, potential changes in the international markets coincident with large-scale natural disturbances enhanced by climate change (fire, insects) could challenge this adaptive capacity. 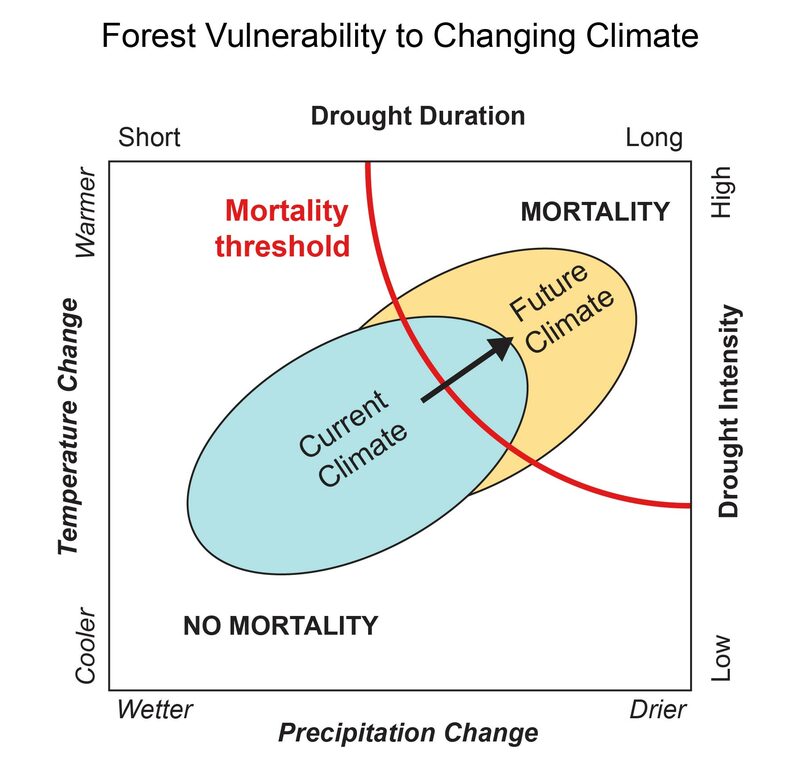 An important uncertainty is how people will respond to climate change in terms of forest management. Climate change will affect trees and forests in urban areas, the wildland-urban interface, and in rural areas. It will also challenge forest landowners managing forests for commercial products, energy development, environmental services such as watershed protection, or the conversion of forestland to developed and urban uses or agriculture. With increases in urbanization, the value of forests in and around urban areas in providing environmental services required by urban residents will increase.43 Potentially the greatest shifts in goods and environmental services produced from forests could occur in rural areas where social and economic factors will interact with the effects of climate change at landscape scales. A significant economic factor facing private forest owners is the value of their forestlands for conversion to urban or developed uses. Economic opportunities from forests include wood products, non-timber forest products, recreation activities, and in some cases, environmental services.1,43 Less than 1% of the volume of commercial trees from U.S. forestlands is harvested annually, and 92% of this harvest comes from private forestlands.89 Markets for wood products in the United States have been affected by increasingly competitive global markets,92 and timber prices are not projected to increase without substantial increases in wood energy consumption or other new timber demands.43 Urban conversions of forestland over the next 50 years could result in the loss of 16 to 31 million acres.43 The willingness of private forest owners to actively manage forests in the face of climate change will be affected primarily by market and policy incentives, not climate change itself. Lack of fine-scale information about the possible effects of climate changes on locally managed forests limits the ability of managers to weigh these risks to their forests against the economic risks of implementing forest management practices such as adaptation and/or mitigation treatments. This knowledge gap will impede the implementation of effective management on public or private forestland in the face of climate change.